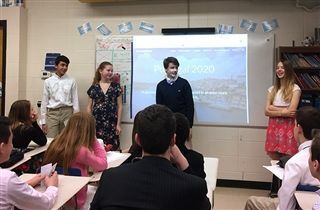 On March 14, seventh grade students took part in the final presentations of their Euro projects. For the last eight weeks, seventh grade students have been hard at work on this interdisciplinary, collaborative project that ties together English, math, geography, and art class curriculums. Each group was assigned a European country and was required to create a bid for that country to host the 2020 Olympics. Along the way, students produced a website, promotional video, Olympic mascot, and several pieces of writing on the history, geography, and culture of their country. Team Czech Republic was recognized for having the best overall presentation this year as well as the best video. Team Spain was recognized for creating the best mascot. This page has links to each group’s website, which includes their mascot, promotional video, and research about their country.